Panasonic to showcase Full HD 3D TV at IFA | What Hi-Fi? Highlight of the Panasonic stand will be its 3D Cinema Experience area, which will include two dedicated 3D cinemas fitted out with its Full HD 3D home cinema system. We first caught a glimpse of 3D TV at CES in Las Vegas back in January, and now other companies are jumping on the bandwagon, including Sky, which is set to launch 3D TV in the UK in 2010. Panasonic says its IFA demo "goes well beyond today's conventional 3D technology, with far superior Full HD picture quality and a lifelike viewing experience". 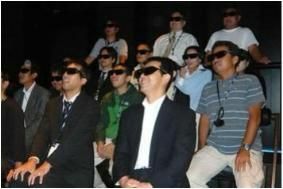 Vistors to IFA will be able to watch 3D film trailers, as well as take part in an "unparalleled 3D experience". The company will also unveil more new Viera TVs, extending its V10 NeoPDP range to include 58in and 65in plasma models. We'll be there throughout the show to bring you all the latest technology news here on whathifi.com.